Lieutenant Micah Leigh is a new helmsmen at Outpost 112 and has yet to be assigned a specific ship. Physical Description: Slim and small, with dark hair and the typical black irises of a Betazoid. She likes natural hairstyles. Micah was born on the planet of Betazed. 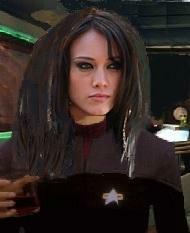 She did not want to be part of her parents' community and ran away from home to join Starfleet. At first, Micah struggled, particulary in coping with the emotions of those around her, but she soon learned to use her ability to her favor. She began using her ability to manipulate others and benefit herself, but she learned to trust others and is weaning herself from using her abilities selfishly. During her time in Starfleet, Micah has shown a strong ability of piloting and navigation, making her an ideal candidate for larger starships, although she also shows ability at piloting smaller craft. She was transferred to Outpost 112 to await orders for an assignment to a starship. An incident involving the death of Micah's parents and sister devastated her and drove her to seek companionshi—primarily from males, giving her a somewhat promiscuous reputation. Personal Traits: Micah speaks with the usual Betazoid accent. She is outgoing and flirtatious, friendly to most people. She is very good at reaching out to others, due to her empathic ability. She is somewhat eccentric and likes the company of men. she is dedicated to her closest friends and very protective over them. Hobbies: Micah enjoys piloting any type of craft and studying maps of the stars. She also enjoys singing and dancing and being at the center of the party lifestyle.